TPPI Information – Power to the Public! Here are some more relevant pages from this exemplary effort. What do you mean by “Public Power”? We mean “public power” in the sense that the Thurston County Public Utility District (PUD) would own, operate and maintain the electrical infrastructure in Thurston County as a non-profit public service, instead of county residents being forced to buy overpriced electricity from the for-profit, foreign monopoly Puget Sound Energy. What are the benefits of Public Power? Public Power will create local jobs maintaining and improving the electrical system, and will enable the people of Thurston County to have control over local energy policy. 1) Creates Local Jobs — PSE outsources most of the maintenance work for Thurston County, in favor of centralizing operations in King County. The Public Utility District (PUD) will hire local skilled workers based in Thurston. Local jobs means more money spent in our community… and that makes life richer for all of us. 2) More Reliable Service — Shorter overall power outages with Thurston County-based repair crews vs. getting whomever is available from the contractor’s pool of workers, few of whom live in Thurston County and none of whom are based here. 3) Energy Democracy with Local Control — Gives citizens oversight of the energy system in Olympia by allowing them to elect the people who manage it. 4) Lower Rates — Public Utilities nationwide have lower rates than corporate- or investor-owned Utilities (IOUs). Here in Washington, everyone who writes a check to PSE pays more for their electricity than anyone else in the state–significantly more than the rate-payers of Avista or PacifiCorp, the state’s other two privately-owned utilities. Public Power takes the profit out of what should be considered part of a commons — a public service that all of us use … why should a privately-held monopoly control something we all need to live our daily lives? 5) Reinvest millions of dollars into the local economy — Every year, Puget Sound Energy sends millions of dollars in profit OUT of Thurston and back to Australia, home of PSE’s parent company Macquarie. That’s MILLIONS of dollars that could be reinvested locally in our own community. Public Power would keep this money in Thurston County. Since each dollar spent in local businesses multiplies about six times, this would add tens of millions to our economy every year! Why will my rates be lower with a public utility? 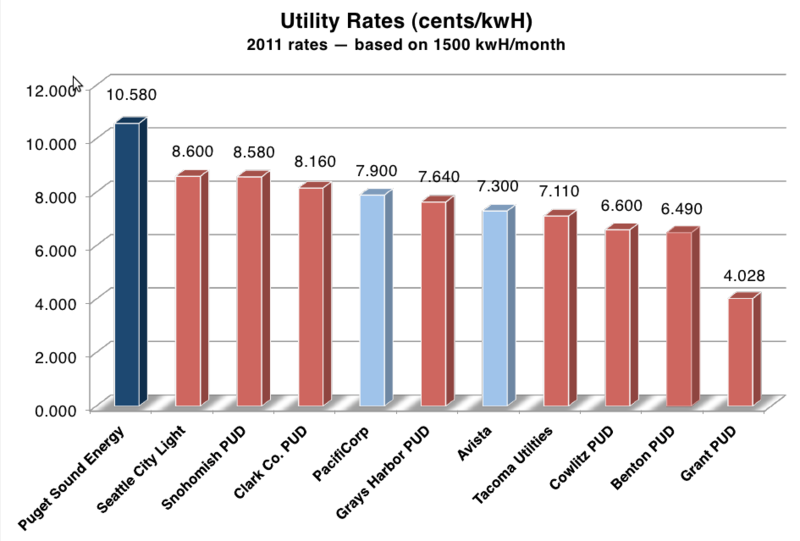 PSE has the highest electric rates in the state of Washington. Public utilities all over the state have much lower rates. Your electric rates will be lower for two reasons: First, because public power entities like PUDs and cities like Tacoma and Seattle who own their electric systems have first right to low-cost Bonneville Power Association (BPA) hydro power. Every PUD in the state of Washington has lower electric rates than PSE. Second, PUDs are non-profit municipal corporations. Unlike PSE, who pays its shareholders a WUTC-allowed 7.8% profit, and its executives huge salaries, the money from your electric bill goes to building and maintaining your electric system. But PSE says it will cost MORE for electricity from the PUD. How do we know it won’t? That’s exactly what they’ve said in all the other counties that had ballot initiatives on Public Power. If that’s the case, why do PSE’s rate-payers PAY MORE than any Public Utility customer? Every single public power customer in the state pays at least 10% LESS that PSE customers pay, and some pay 58% less. Even Jefferson County, who will throw the switch on Public Power in May 2013, will have rates the same as or lower than Puget Sound Energy–from whom they bought their entire system! Jefferson County PUD customers will NOT PAY ridiculously high executive salaries or corporate profits, are eligible for at-cost federal hydropower, and pay lower interest rates on borrowing, so they can charge the same or lower rates. There is no evidence to support the claim that Thurston County will be any different. How does a public utility enhance democracy? Getting power from a public source gives you a voice in how the source operates. With Puget Sound Energy, the only people that have a voice are the owners of the private Australian/Canadian conglomerate, Macquarie. With a PUD, control rests with three elected commissioners. The PUD meetings are all open to the public and the Public Records Act requires that you can get any information you want about the PUD’s operations. If you don’t like what the PUD is doing, you can vote out the commissioners and change it. If you don’t like what PSE is doing, you don’t have any options, other than to petition the Washington Utilities and Transportation Commission (WUTC), which sets PSE’s rates and terms of service–and has never denied them a rate increase while at the same time allows them up to a 7.8% return to their shareholders. If you own a business, you know how ridiculously high that is, especially in a recovering economy. The PUD is conducting a business assessment study evaluating alternatives that might begin with only a portion of the County. Based on a total countywide assessment of PSE property of just over $130 million and a premium for acquisition, the initial costs for starting with part of the county might be in the range of $50 million. Experts tell us that the cost for the entire county will be about $170-220 million. These amounts can easily be raised by selling municipal revenue bonds (see below). Thurston County taxpayers will NOT owe the debt; the PUD will. It will be paid off by part of the electric rate, just as the interest, depreciation, and shareholder return is currently a part of the PSE rate. This is a solid investment that will certainly pay off in the long run. The interest rates on municipal bonds are much lower than the profit margin taken by Puget Sound Energy, and will be paid out of the revenues from electricity sales (i.e. no money will be borrowed to pay for it). Revenue municipal bonds allow communities to finance the furnishing of necessary local services, such as electricity, water, and waste treatment. Municipal bond financing is considered the cornerstone of public infrastructure programs and an important resource for public power systems. Community-owned utilities (PUDs, water and sewer districts, and Cities and Towns) regularly finance projects with municipal bonds. In other words, the Thurston County PUD will pay for this just like the cities and counties across the country raise funds for infrastructure improvement. They will issue municipal bonds that will be easily paid off over 20 – 30 years by the revenue from the PUD’s electrical operations. Not due to this initiative! Everything will be paid for with the revenues from the sales of electricity, at a lower cost to consumers since the PUD won’t be trying to reap a profit from them. What if Puget Sound Energy doesn’t want to sell the electrical infrastructure to the PUD? They don’t have a choice. If PSE doesn’t want to sell, Washington State Law allows the PUD to exercise its condemnation authority and force PSE to sell at fair market value. This is the choice of last resort and we’re hopeful that PSE will agree to sell at a price that is fair to both them and the people of Thurston County. Has this been done anywhere else? Was it successful? Thurston County is literally surrounded by public power. Today 55% of customers in Washington state are supplied by Public Power at lower rates than we pay PSE and with better reliability and higher customer satisfaction. How do we know that the PUD is going to be able to manage the electric system well? The Thurston County PUD has a long history of providing great service with another utility, water. Adding electricity will simply mean hiring people with experience, some of whom most likely are currently working for PSE. The solution to a lack of experience is simple and used by businesses when they want to expand into a new market: you hire people with experience. What does the ballot initiative say? “Shall Public Utility District No. 1 of Thurston County construct or acquire electric facilities for the generation, transmission, or distribution of electric power?”There will be a checkbox for Yes and another for No. We recommend “Yes”. We are a Washington state-registered non-profit, working with a diverse group of local volunteers to bring public power to Thurston County. You can see who is on our Executive Board and find contact information for us on our Contact page. You can also interact with some of our members at our Facebook page. How did you get so many signatures to get this on the ballot? We can always use more volunteers, and we’d love to have more input from the community. Please contact us for information on how to help out, and when/where we are having meetings.The people of Thurston County are fed up with PSE’s high rates, poor reliability, and crumbling infrastructure. They are ready for a change. We have an INCREDIBLE group of volunteers who collected in snow, rain, strong winds, and for long hours at a stretch, and who never gave up. We asked everyone we saw if they vote in Thurston County. If the answer was yes, we asked them to sign the petition. How can I contribute to the success of the initiative? Take a look at our “How to help” page to learn about how you can volunteer with us, or send an email here. Another thing you can do, is make a donation to help us cover the costs of running the campaign. We’ve put together some of our essential materials for volunteers and friends of the Public Power campaign on our Campaign Resources page. Check it out! * Thurston PUD Fact Sheet on Prop. 1 – This document was created by Thurston PUD staff. * “Public Power: Shining a Light on Public Service” – American Public Power Assn.